I’ve been making this recipe since my sister and I were kids. 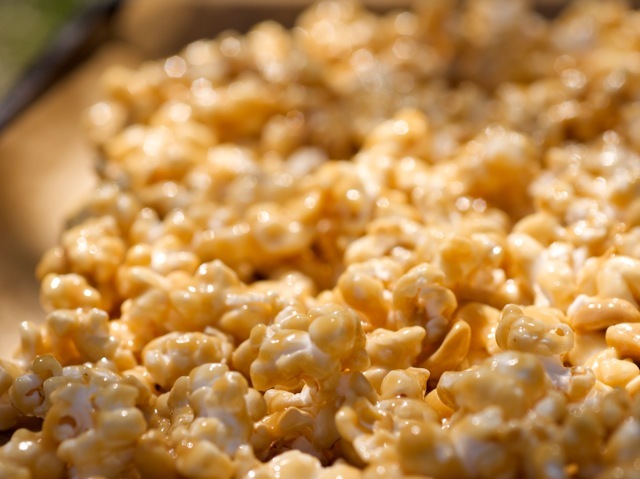 The original recipe contained corn syrup and sugar, and in larger quantities; this version makes smaller clumps of softer, chewier popcorn, which seem to stay fresh longer and keep me from worrying about losing fillings when I eat it! This slightly healthier version tastes every bit as good as the original did, and I’m not beyond polishing off most of a batch without any help. Cover a baking sheet with a piece of parchment or waxed paper. Put the popped corn in a large bowl, and remove any unpopped kernels. Salt it lightly, add the nuts, and keep the bowl warm. Meanwhile, bring the honey and brown-rice syrup to a boil in a medium saucepan. Boil hard for about 2 minutes, watching it so that it doesn't boil over; remove from the heat, and carefully stir in the peanut butter. (For a more traditional, crunchy popcorn ball, cook the honey and brown-rice syrup longer.) Add the vanilla, whisk the mixture smooth, and quickly pour it over the warm popped corn and nuts. Using a heatproof spatula or large spoon, turn the mixture over to evenly coat the popped corn and nuts. Dump the mixture out onto the lined baking sheet and spread it evenly across the sheet. Allow the mixture to cool slightly before breaking it up into clumps. You can also shape it into popcorn balls, if desired. A combination of peanuts and cashews is my favorite, but this is also good with almonds or hazelnuts. You can also use cashew butter, almond butter, or any other nut butter instead of peanut butter.